A recent accession into the archives was this fragile photograph album, dating from the late nineteenth century. It was found in the home of the late Beatrice Boulender of Niagara Falls and was donated to the archives by her great-neice, Aaron Baptiste. The album contained 32 ‘cabinet card‘ style photographs of a number of individuals and families. Many of the photos were taken in Napanee at the studio of J. S. Hulett, who was a photographer in the town for over 25 years. One of the pictures was taken in Deseronto and one in Brighton. There are a significant number of photographs that were taken in Watertown, New York and a few in Plainwell, Michigan. The picture below shows the See family and was taken in Bathgate, North Dakota. John See was born in Ontario in 1854 to Samuel and Mary See, who had both been born in England in around 1809. Samuel was a farmer. Census records show that John was the youngest of seven children, all of whom were born in Canada except the eldest, William. This means that the family must have come to Canada between 1833, when William was born, and 1837, the year of Elizabeth’s birth. Between 1851 and 1881 the family were living in Richmond township, Lennox County (in or close to Napanee). By 1861, John’s father had died and his brother-in-law, Thomas Brown, was living with the remaining members of the See family. The same family grouping is seen in 1871, by which time Thomas and Elizabeth Brown already had five children of their own. In 1881 John was married and living with his wife, Mary, and their two eldest children, William (4) and Annie (1), still in Richmond township. In 1886 they left Canada and moved to the United States. 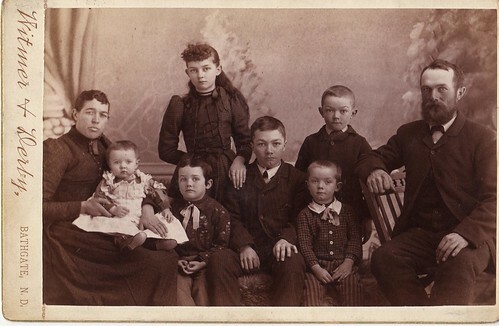 The 1890 US census was destroyed by fire in 1921, but in 1900 the family were living in North Carlisle, Pembina, North Dakota, by which time they had seven children: William (23), Annie (20), James (17), Thomas (13), Richard (11), Grace (8) and Allice May (2). In this photograph, the baby is probably Grace and the picture would date from around 1893. The album clearly has a connection to the Quinte area: it seems to record images of friends, or perhaps family, who had moved away from the immediate locale and who kept in touch by sending back their photographs. As yet, we don’t know the exact connection of the people in the album to Beatrice Boulender’s family. All the photographs from the album are now available through our Flickr account. We’d be interested to hear from you if you have any connection with any of the families who are pictured there. Thanks Trish! I’m mainly interested in making the link between Beatrice Boulender of Niagara Falls and the people in the photograph album (although that is a long shot!). This family was one of the few that I could reliably identify from census records (and was the group that had travelled furthest away from this area). I thought it was worth sharing what I’d managed to discover about them: if there are any more details you can add about the family from a local perspective, then that would be great.